This tube tent is lightweight, versatile and sets up easily so you can rest quicker. It is one of the most common forms of emergency shelter found in survival kits. It comes with the ridge cord that lifts the center up and forms the tent. Tie off the cord to two trees. Coghlan's Tube Tent has enough room for 2 people and is also fire retardant. As an emergency shelter, you can stay dry and out of the wind. Place your gear at each end of the tent to close off any unwanted breeze or use your poncho to close off one of the openings. A quick, ready made tent so you don't have construct a field shelter. Field shelters take a lot of time to make and if weather is a factor, a quick cover over your head will go a long way. You can also use this tube tent as a tarp to stay out of the sun, keep other things dry, or as a ground cloth so your bottom stays dry. My eleven year old figured out how to use and set this up during a camping trip just from the directions included. I gave her an extra set of hands but she was in charge and figured it all out on her own. It was up within minutes. Easy to use in an emergency. You won't be using time because of difficulty. A lightweight emergency shelter such as this tube tent should be included in every survival kit or bug out bag. You could certainly spend the time creating a shelter from branches and other natural materials, but having one ready-made would be a tremendous time saver. 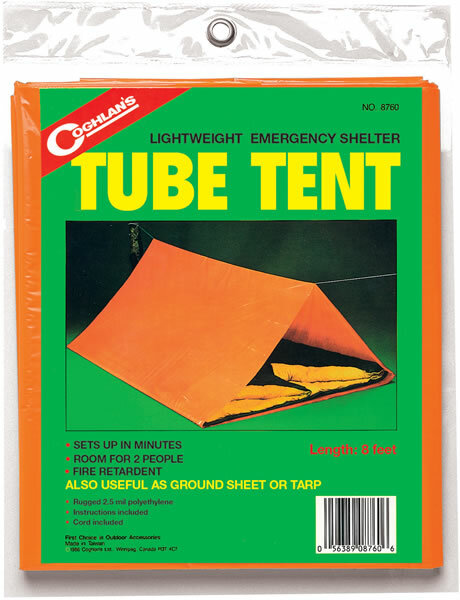 If you're creating your own kit, be sure to have one tube tent for every two people. Or else someone (YOU) will be sleeping under the stars. Not bad unless it's raining. More on shelter supplies. This rugged 2.5 mil polyethylene shelter is fire retardant and lightweight. Shelter sets up in minutes and provides enough room for 2 people. Cord included.